A new hysterical video that’s making the latest rounds on the Internet shows a woman taking a tumble just over the shoulder of news reporter Joe Torres. 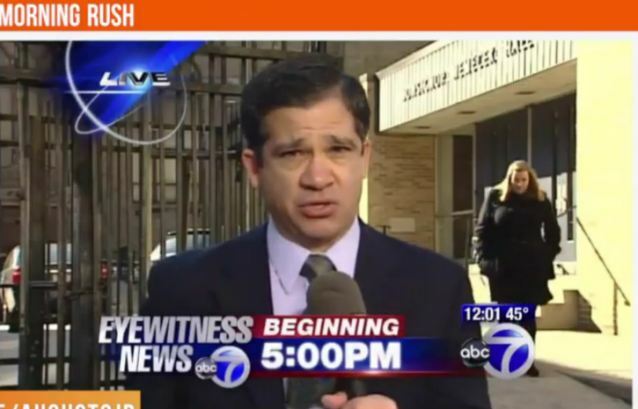 In the clip, ABC New York News Channel 7’s Joe Torres is reporting from in Bedford Park, New York when a young lady walks out of a building in the background. Church bells are ringing as she makes her way behind him. Then she suddenly tosses up her arms and she falls from the camera’s view. Joe Torres, proving that chivalry is in fact dead, nonchalantly glances behind him at the woman on the ground and coldly returns to reporting. Moments later, the young woman reappears as she springs to her feet and walks off. As of Sunday night, the video had nearly 800,000 views.